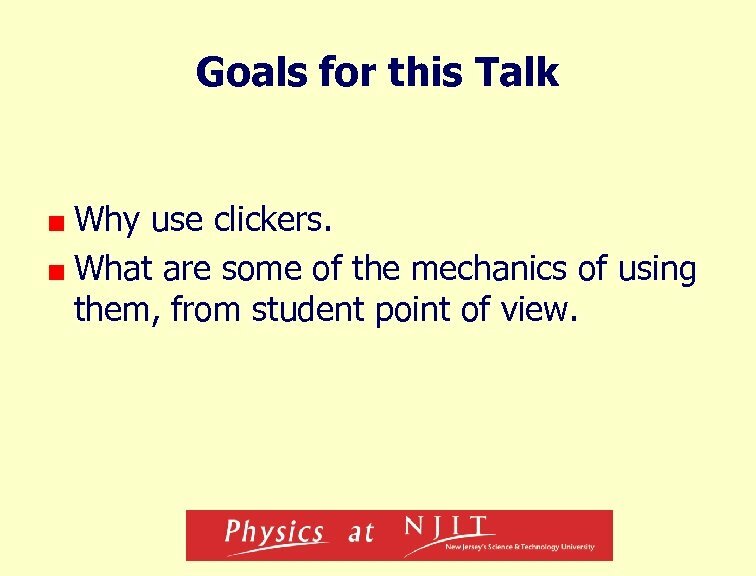 Goals for this Talk Why use clickers. 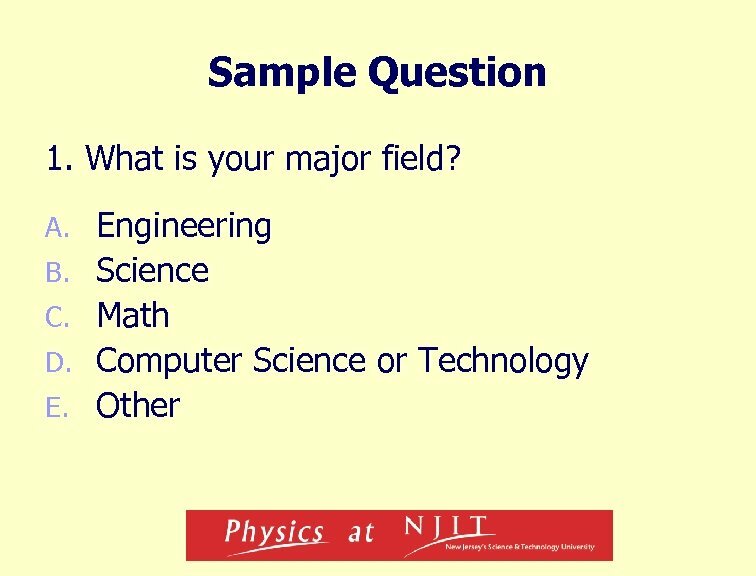 What are some of the mechanics of using them, from student point of view. How Did Past Students Like It? Student evaluation results: What are the best features of this course? 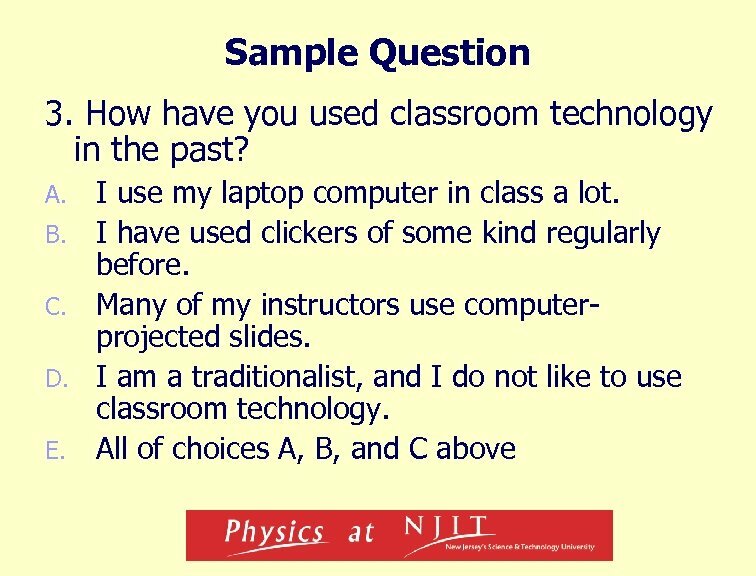 n n n n I liked the i-clicker i. Clicker The powerpoint slideshows with notes. 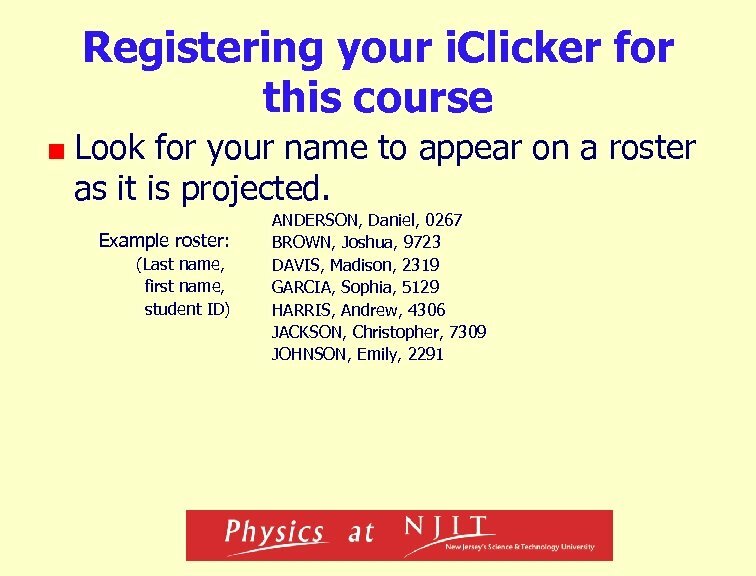 The i. Clickers. 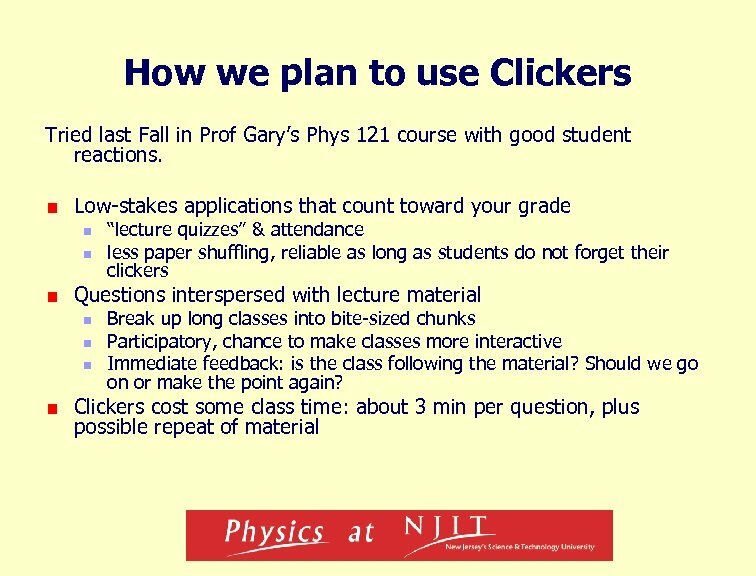 We used i. Clicker in Lecture. This program was excellent in helping us stay involved with the lecture. The Iclickers were something new to try. Powerpoint with Clicker Powerpoint Presentations. 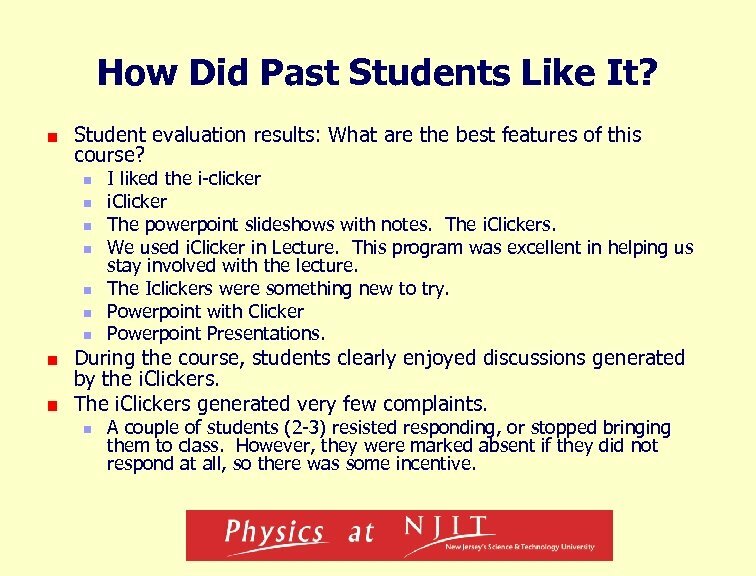 During the course, students clearly enjoyed discussions generated by the i. Clickers. The i. Clickers generated very few complaints. n A couple of students (2 -3) resisted responding, or stopped bringing them to class. However, they were marked absent if they did not respond at all, so there was some incentive. 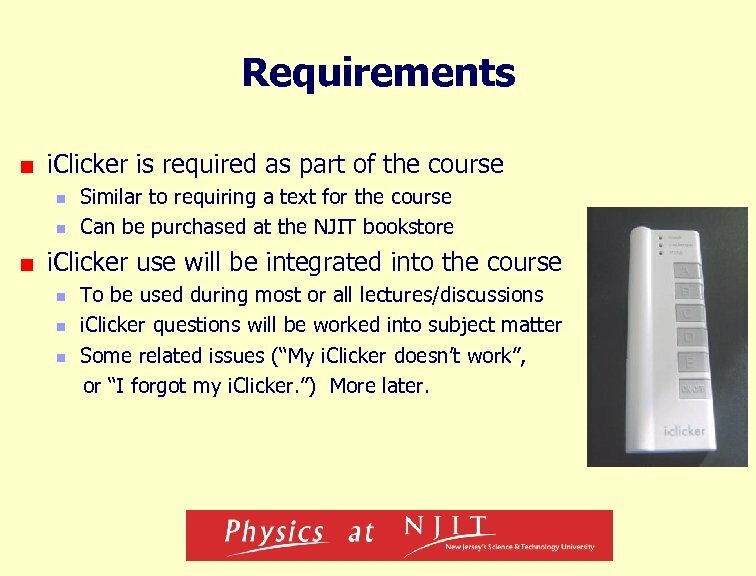 Requirements i. Clicker is required as part of the course n n Similar to requiring a text for the course Can be purchased at the NJIT bookstore i. Clicker use will be integrated into the course n n n To be used during most or all lectures/discussions i. Clicker questions will be worked into subject matter Some related issues (“My i. Clicker doesn’t work”, or “I forgot my i. Clicker. ”) More later. 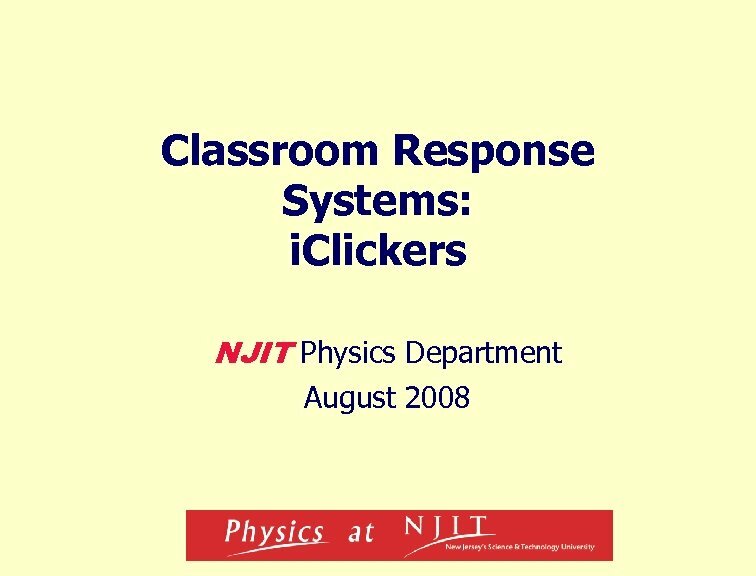 The Clicker “Clicker” is the familiar term for Classroom Response System. 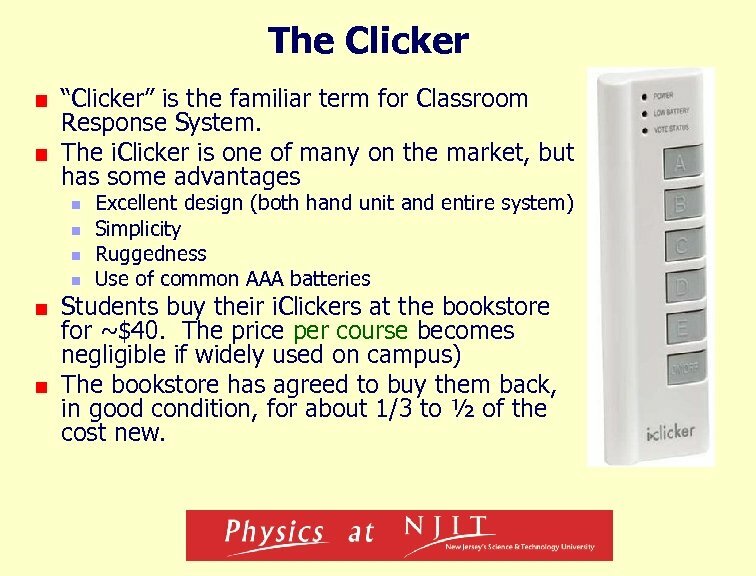 The i. Clicker is one of many on the market, but has some advantages n n Excellent design (both hand unit and entire system) Simplicity Ruggedness Use of common AAA batteries Students buy their i. Clickers at the bookstore for ~$40. The price per course becomes negligible if widely used on campus) The bookstore has agreed to buy them back, in good condition, for about 1/3 to ½ of the cost new. How will we use the clicker? ü I pose questions on the screen during lecture. ü You answer using your i>clicker remote. ü Class results are tallied. ü I can display a graph with the class results on the screen. ü We discuss the questions and answers. ü You can get points (for participating and/or answering correctly)! 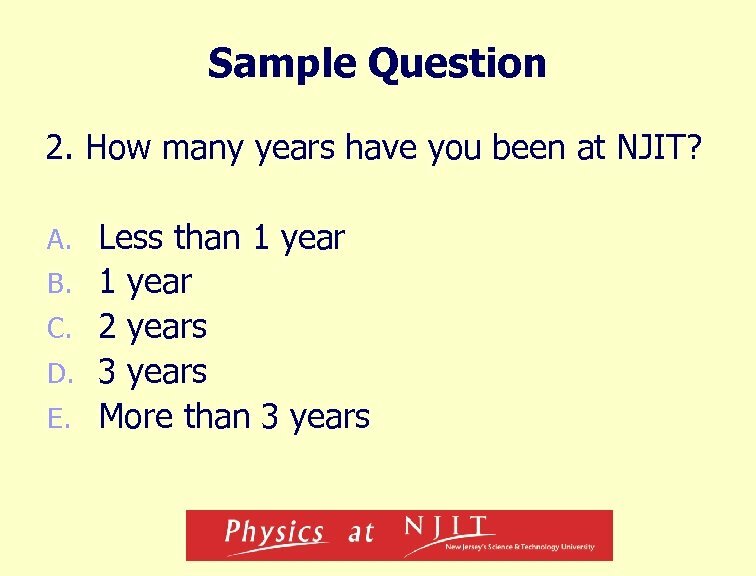 These can be recorded (e. g. , for quizzes and attendance). How do you vote? 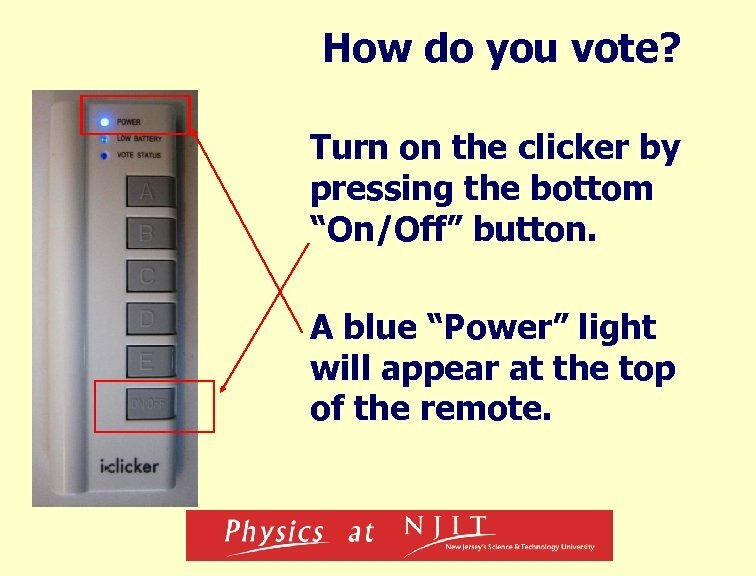 Turn on the clicker by pressing the bottom “On/Off” button. A blue “Power” light will appear at the top of the remote. How do you know your vote was received? Check your “Vote Status” Light: n Green light = your vote was sent AND received. 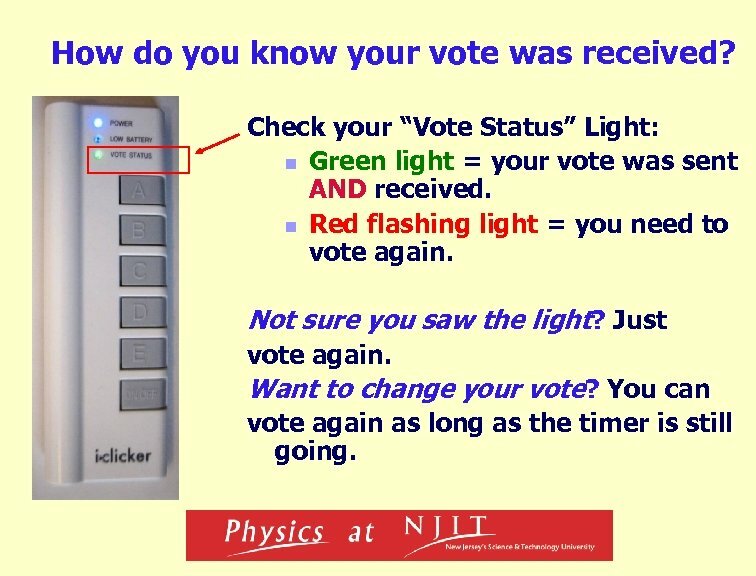 n Red flashing light = you need to vote again. Not sure you saw the light? Just vote again. Want to change your vote? You can vote again as long as the timer is still going. Clickers 4. 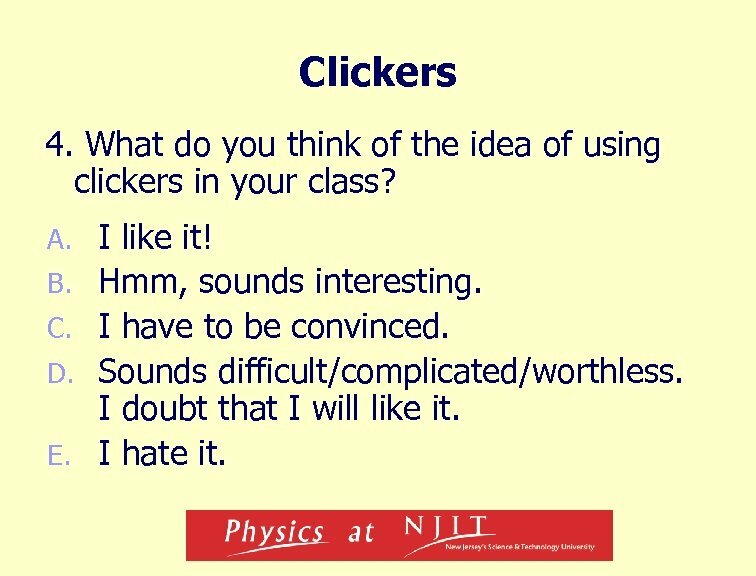 What do you think of the idea of using clickers in your class? A. B. C. D. E. I like it! Hmm, sounds interesting. I have to be convinced. Sounds difficult/complicated/worthless. I doubt that I will like it. I hate it. 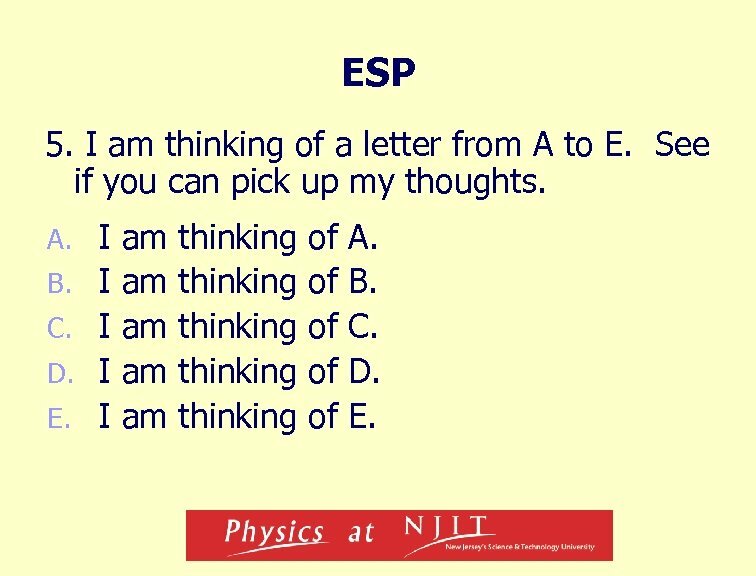 ESP 5. I am thinking of a letter from A to E. See if you can pick up my thoughts. A. B. C. D. E. I I I am am am thinking thinking of of of A. B. C. D. E.
ESP-2 6. Let’s do it again, but show the graph while you select your answer. 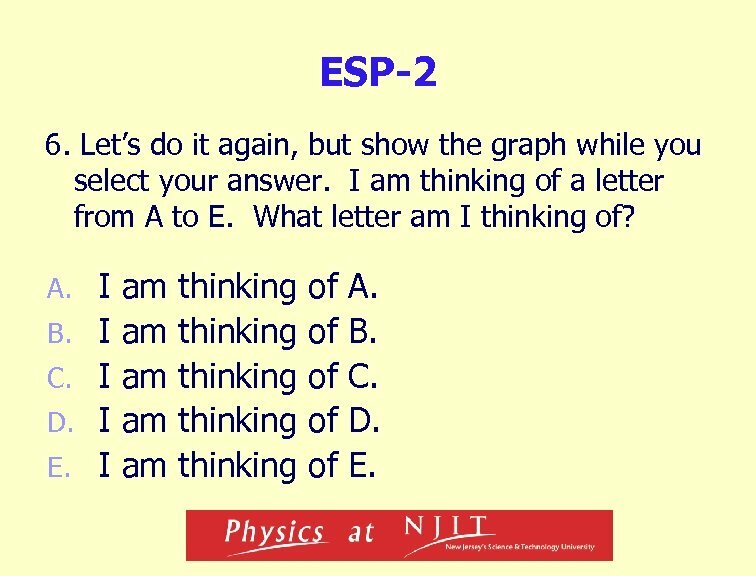 I am thinking of a letter from A to E. What letter am I thinking of? A. B. C. D. E. I I I am am am thinking thinking of of of A. 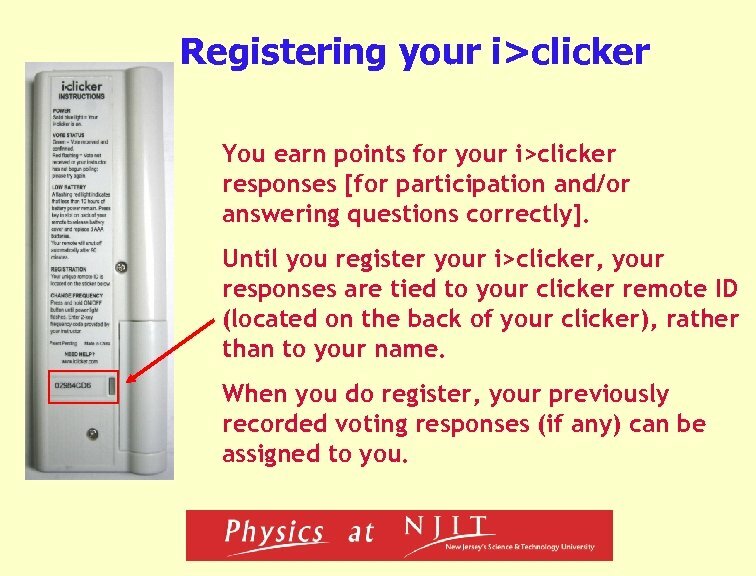 B. C. D. E.
Registering your i>clicker You earn points for your i>clicker responses [for participation and/or answering questions correctly]. 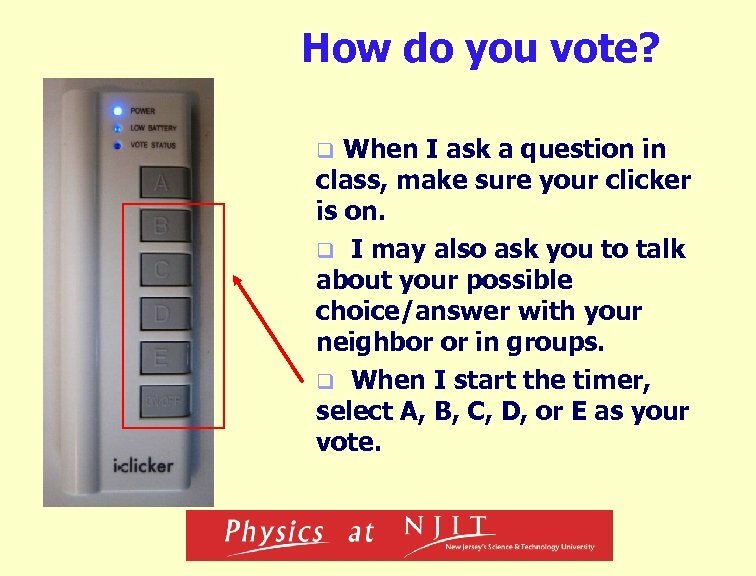 Until you register your i>clicker, your responses are tied to your clicker remote ID (located on the back of your clicker), rather than to your name. When you do register, your previously recorded voting responses (if any) can be assigned to you. 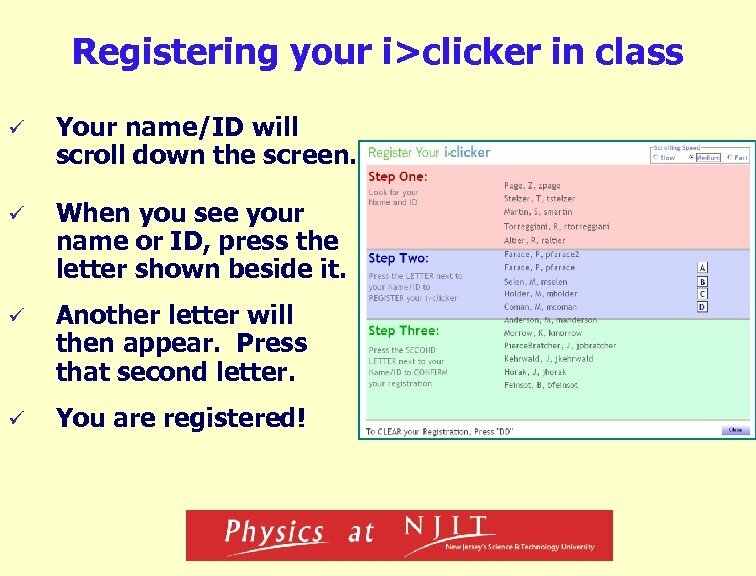 Registering your i>clicker in class ü Your name/ID will scroll down the screen. ü When you see your name or ID, press the letter shown beside it. ü Another letter will then appear. Press that second letter. ü You are registered! 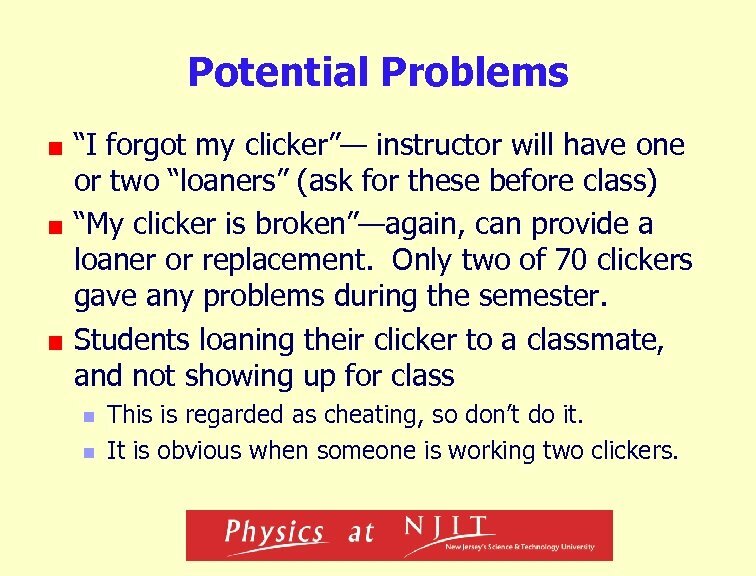 Potential Problems “I forgot my clicker”— instructor will have one or two “loaners” (ask for these before class) “My clicker is broken”—again, can provide a loaner or replacement. Only two of 70 clickers gave any problems during the semester. 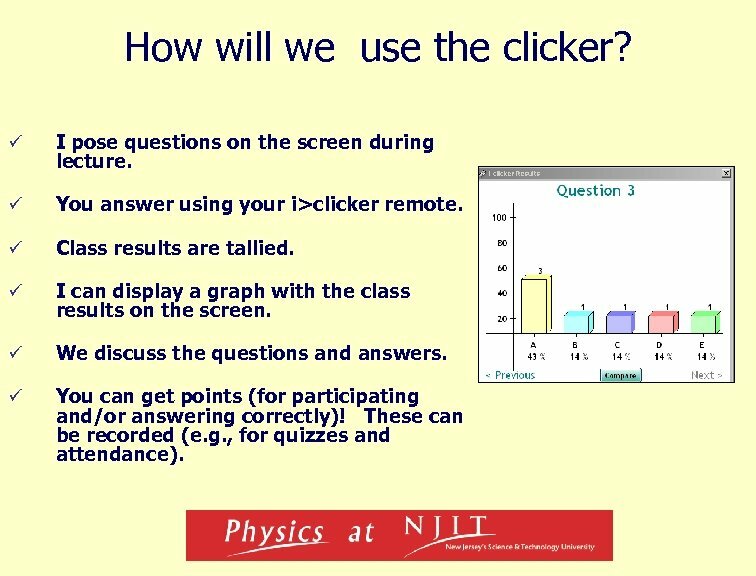 Students loaning their clicker to a classmate, and not showing up for class n n This is regarded as cheating, so don’t do it. It is obvious when someone is working two clickers.